Lock in a great price for Tunisia Palace – rated 8.5 by recent guests! 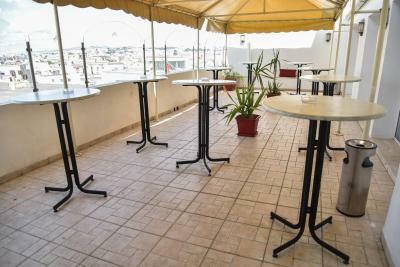 Just a block from the Medina, on Tunis' main central street, you can also walk to the bus and train stations so the location is very convenient. If you get a larger room with a balcony, it is worth the incremental difference. Otherwise, the standard room can be quite small. Mr Mahdi the manager and the reception staff Rabab and MaJed were extremely helpful. Location is central. Breakfast was nice. Rooms were comfortable. Staff were friendly and helpful. Staff. All trying to help but the facility didn't match their efforts. All young and motivated and trying to do the best but the hotel already ageing with lack of interest to upgrade as it looks. Young staff trying their best to accommodate people. Unfortunately, language barrier (esp with English), and lack of proper training for such 4-stars hotel. Location is decent and access to city centre. Comfy beds in our junior suite, good on site restaurant (especially the fish), great location right next to the Medina and Avenue Habib Bourguiba. Amazingly helpful staff. Good wifi. Disponibilità a venire incontro alle esigenze con garbo. Le stanze sono confortevoli. الموقع على امتداد شارع بورقيبة جهة باب البحر (المدينة العتيقة) وايضاً النظافه وستايل الفندق جميل. Tunisia Palace This rating is a reflection of how the property compares to the industry standard when it comes to price, facilities and services available. It's based on a self-evaluation by the property. Use this rating to help choose your stay! 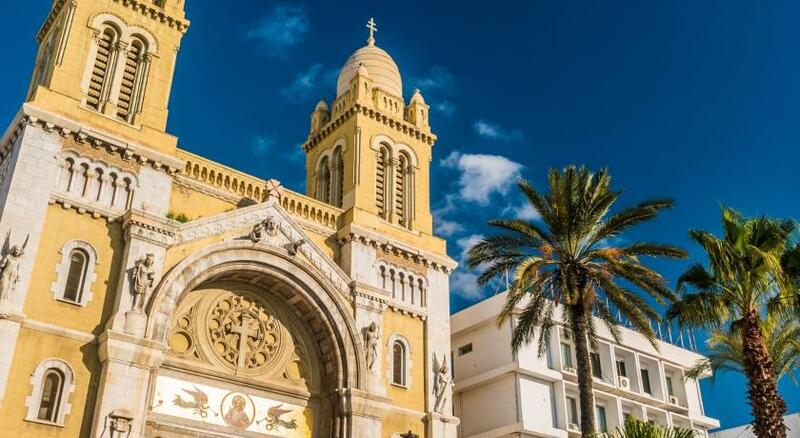 One of our top picks in Tunis.Located on the city's main avenue, in a historic building renovated to modern standards, the hotel Tunisia Palace welcomes you in a sophisticated atmosphere. The hotel has 47 comfortable rooms, from single rooms to the Presidential suite, all decorated with refinement. 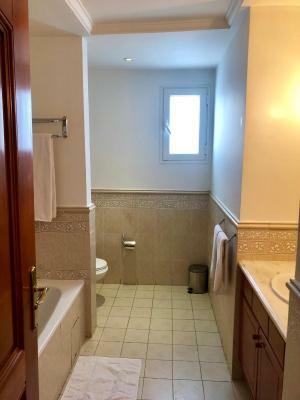 All rooms have a bathroom with bathtub and toilet, air conditioning, safe, heating, satellite TV, cable or Wi-Fi internet access, telephone with direct international dialing, mini bar and hairdryer. The hotel features “Le Dôme” restaurant, “Le 1900” cozy bar, and "Le Bellevue" snack bar. It is also equipped with a fitness center offering a massage cabin, a cabin with hydromassage bath, a sauna, a hairdressing and a beauty salon. Besides, there is a laundry service, a room service and a 24-hour currency exchange. When would you like to stay at Tunisia Palace? A mini-bar, satellite TV and air conditioning are included in the rooms. They are accessed using a key card and an private bathroom is also provided. This triple room has a balcony, soundproofing and cable TV. House Rules Tunisia Palace takes special requests – add in the next step! Tunisia Palace accepts these cards and reserves the right to temporarily hold an amount prior to arrival. There is no kettle in the room to make tea or coffee. Because it is in the very centre of the city, it is too noisy outside when the windows are open. The view from the room was unpleasant. Rooms are of poor quality, retarded TV system, weak WiFi coverage and pathetic bathroom. Safe never work. Carpets all look dirty and towels took hours to be replaced. Breakfast is a low-quality and doesn't support different eaters. Cleanliness floors and water leaks from windows when raining turning room to a misty to breathe. Breakfast is too limited with lack of quakity fruits and poor coffee with no tea options. Elevator is a retro and rooms facing old houses are too noisy with cats and peoplw noises. Take long tile for toilet and shower towels to be replaced and no proper TV facilities as most of the channels were glitch or not clear. I was here a total of 6 nights, 2 on my own and 4 with a group. The breakfast buffet was challenging because of its limited offerings that was of interest to me. Thank goodness for the excellent oranges and dates. The outside terrace is not yet finished but still a nice place to sit with a drink or to have lunch. Not all the staff speak English but this was not a problem, my Arabic is sadly lacking! !